This bass began as a bass given to my favourite bassplayer, Mark King of Level 42 and the carte blanche it began from. 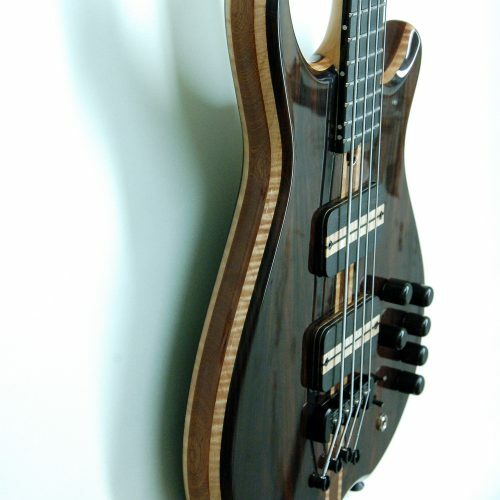 Last year I built a very special version of the bass itself with the improvements that had gained from almost ten years of R&D and that became so popular I now launch it as a model of its own. Based upon the Artist MK I model, It has a slightly smaller body, shorter and thinner horns. 32" Scale makes it as fast and playable as anything else on the planet. Incredibly fast response and highly dynamic. The Neck is set into the body with 4x incredibly strong M6 bolts. Both incredibly stable fundament but highly dynamic. A killer bass! Neck 32" scale, Maple/purpleheart 7-ply bookmatched. Round slim neck profile. 19,5 mm @ 1st fret. 16,5 or 19 mm spacing at bridge string to string. Body Selected bookmatched centre joined quartersawn mahogany and bookmatched Wenge with contrast maple veneer. 340 mm width at lower bout. Preamp Active Master 4- band. Vol | Bal | Treble | Hi Mid | Lo Mid | Bass | active/passive switching, Quad sw. x2 + lo/medium impedance switch.